Chondrodysplasia punctata is a multisystem disorder, primarily involving the musculoskeletal system, skin, and eyes. Children with the rhizomelic form of this syndrome have characteristic facies with a saddle-nose deformity, hypertelorism, and frontal bossing. The musculoskeletal changes include proximal limb shortening, flexion contractures, congenital hip dislocations, and the characteristic radiographic finding of epiphyseal stippling of the axial skeleton and long bones. The most common ocular findings are cataracts and optic atrophy. We describe herein the first reported case of microspherophakia in association with the rhizomelic form of chondrodysplasia punctata. FIGURE 1: Note dysmorphic cranial features including a prominent squared forehead, hypertelorism, and saddle-nose deformation. The Conradi-Hunerman syndrome is the most common form of chondrodysplasia punctata, occurring sporadically or inherited in an autosomal dominant manner.8 Clinical expression of the disease is highly variable. In more severely affected patients, the disease is quite similar to that seen in the rhizomelic variety, with death occurring in the first few months of life. Usually, however, patients are only mildly affected, demonstrating asymmetric shortening of extremities, short stature, and typical facies with frontal bossing and a saddle-nose deformity. Radiographically, the stippling of the epiphyseal centers may be generalized and marked or minimal and localized to long bones. Recently, x-linked forms of chondrodysplasia punctata have been described. An x-linked dominant variety,9 occurring exclusively in female patients, with lethality in affected male fetuses, has been described. Clinical characteristics include marked asymmetry of skeletal involvement, and the presence of cataracts and linear skin lesions. Curry et al10 described a pedigree of two families with an x-linked recessive form of chondrodysplasia punctata secondary to the terminal deletion of the x chromosome in affected males and carrier mothers. The phenotypic and radiologic features in the four male children studied were quite similar to those seen in other forms of chondrodysplasia punctata; the presence of mental retardation in these patients was a noteworthy clinical difference. FIGURE 2: Note proximal limb shortening, bell-shaped chest, and joint contractions. Although more than 100 cases of chondrodysplasia punctata have been described in the literature, no other lens anomaly other than the presence of a cataract has been reported. We herein report a case of microspherophakia in association with the rhizomelic form of chondrodysplasia punctata. A full-term, 3080-gram, Caucasian male infant was born to a 25-year-old secundigravida by a spontaneous vaginal delivery after an uncomplicated pregnancy. There was no history of consanguinity, abnormal births, or the use of warfarin during pregnancy. There was no family history of congenital cataracts, microspherophakia, or other congenital ocular deformities. 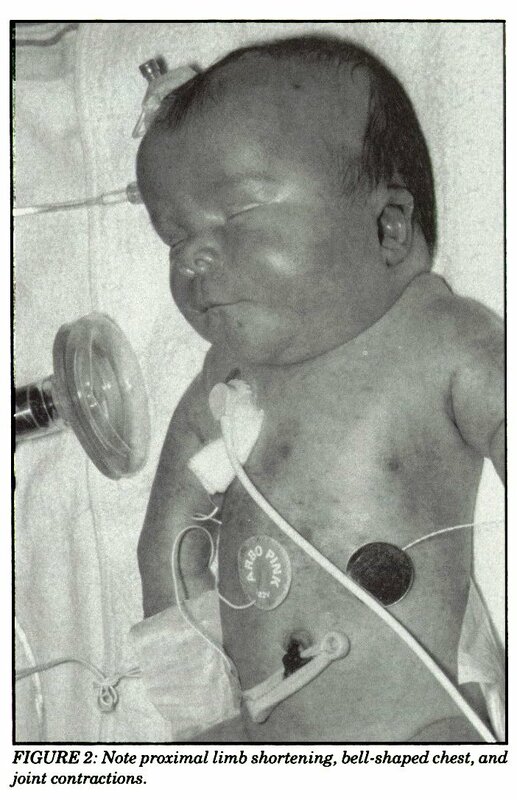 On physical examination, the infant had dysmorphic cranial features (Fig 1). 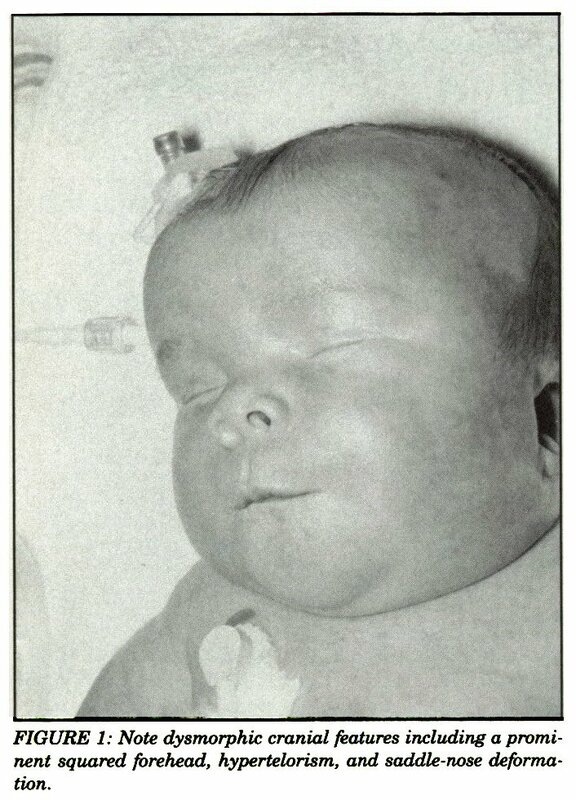 There was a prominent squared forehead, hypertelorism, and nasal hypoplasia/saddle-nose deformity. Other abnormalities included shortening of the humerus and femur, a barrel-shaped chest, and contracture of the knees, ankles, wrist, and phalanges (Fig 2). The hair was sparse; however, the skin was otherwise normal. 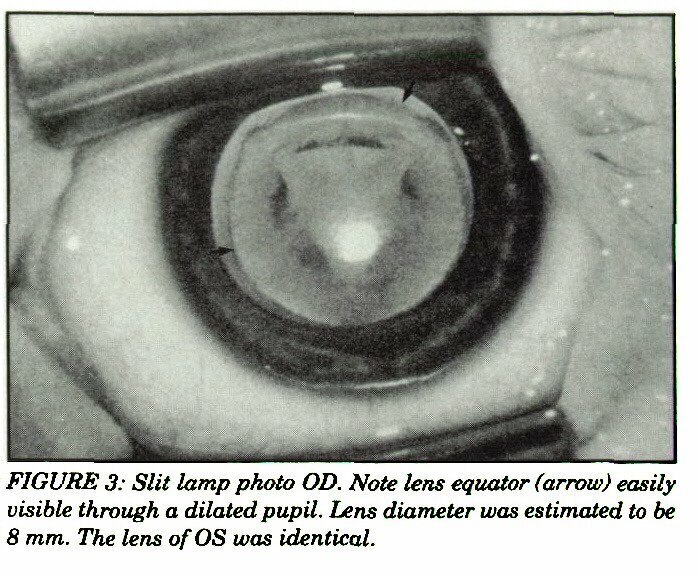 FIGURE 3: Slit lamp photo OD. Note lens equator (arrow) easily visible through a dilated pupil. Lens diameter was estimated to be 8 mm. The lens of OS was identical. 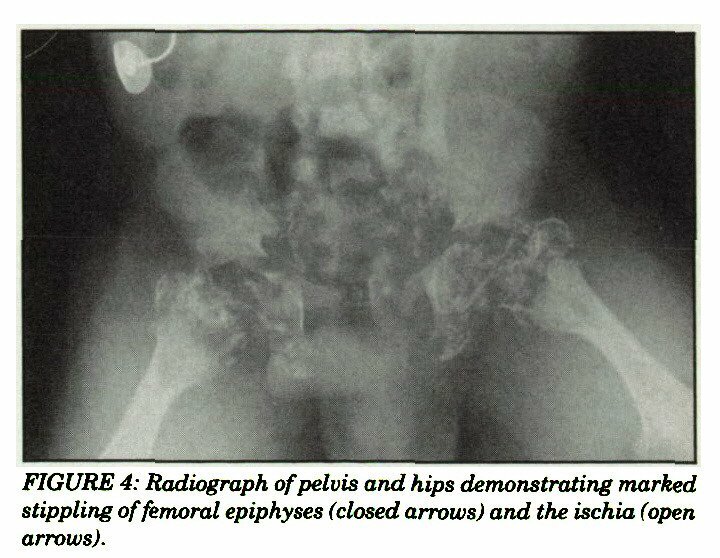 FIGURE 4: Radiograph of pelvis and hips demonstrating marked stippling of femoral epiphyses (closed arrows) and the ischio (open arrows). Ocular examination revealed the presence of bilateral cataracts and microspherophakia (Fig 3). The lens diameter was estimated to be 8 mm and the zonular structures were easily visible through a dilated pupil without evidence of dislocation. Close evaluation revealed complete opacification of the lens in both eyes. Results of the remainder of the ocular examination were normal, including intraocular pressure and retinal examination. A thorough radiologic and metabolic evaluation was performed. Radiographs (Fig 4) revealed bilaterally symmetrical punctate stippling and enlargement of multiple epiphyseal centers and dysplasia of the thoracic spine. The activity of DHAP-AT (performed by Dr Amiya Hajra, University of Michigan), determined from fibroblast tissue culture, was low and compatible with the rhizomelic form of chondrodysplasia punctata. 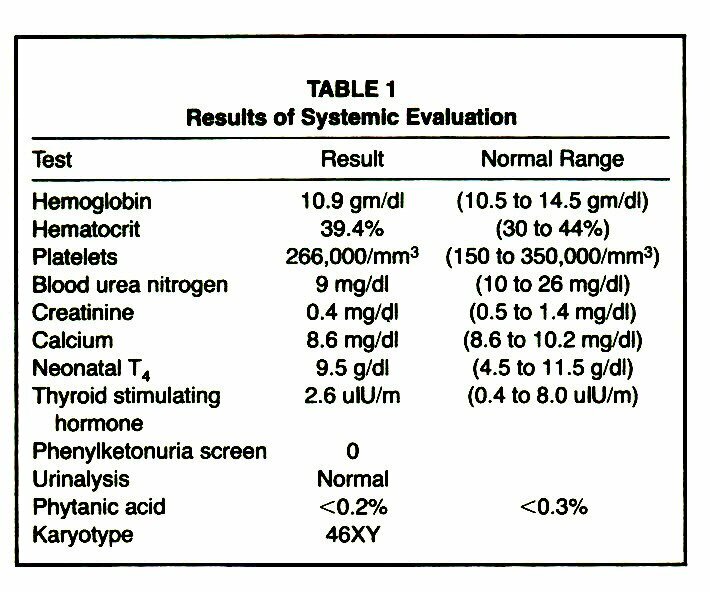 The remainder of the systemic evaluation was within normal limits (Table 1). A diagnosis of rhizomelic chondrodysplasia punctata was made. The poor prognosis for long-term survival was explained to the parents, but they desired and consented to cataract surgery. When the infant was 4 weeks of age, lensectomy and anterior vitrectomy were performed on the right eye via a pars plana approach. The postoperative course was complicated by Staphylococcus epidermidis endophthalmitis, which was successfully treated with an intravitreal injection of gentamicin and cefazolin, daily subconjunctival injection of gentamicin and dexamethasone, and a 14-day course of intravenous vancomycin. The infection cleared without sequelae in 14 days. A lensectomy and anterior vitrectomy were then performed on the left eye without complication. The postoperative course was unremarkable, and on postoperative day 3 aphakic extended-wear contact lenses were placed in both eyes. The patient tolerated the contact lenses well; however, 4 weeks later he developed a respiratory infection and subsequently died of a respiratory arrest. To the best of our knowledge, this is the first reported case of microspherophakia associated with the rhizomelic form of chondrodysplasia punctata. More than 100 cases of chondrodysplasia punctata have been reported, yet no mention of microspherophakia is made in any case even though ocular examinations were performed. Several possible explanations for this inconsistency exist. The accuracy of our diagnosis must first be questioned. 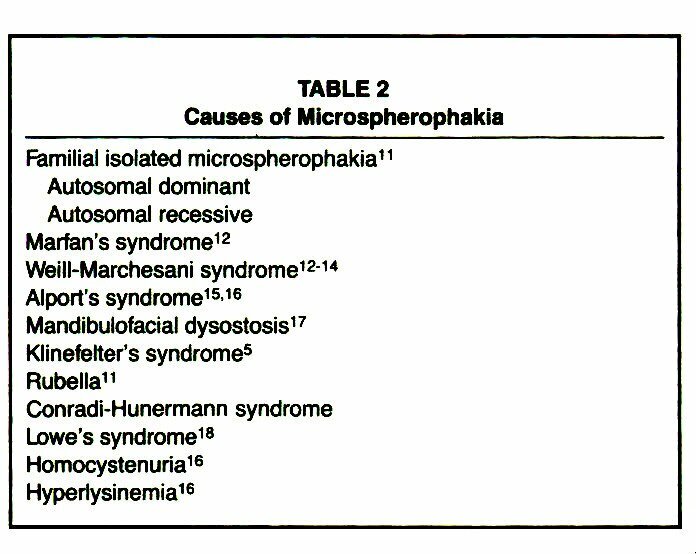 Microspherophakia has been found to occur in association with several other clinical syndromes (Table 2).11-18 Most of these possibilities have characteristics that are sufficiently dissimilar from our case and can confidently be excluded from diagnostic consideration. However, WeiUMarchesani and Lowe's syndromes must be strongly considered in the differential diagnosis. As in our case, microspherophakia, lens opacities, and skeletal abnormalities are important diagnostic findings in these syndromes. In Weill-Marchesani syndrome,13,14 affected individuals are short in stature with proximal limb shortening, marked joint immobility, and flattened nasal bridges. In contradistinction to our case, epiphyseal stippling is not seen. Also, no metabolic abnormality is associated with this disorder, and life expectancy is normal. We therefore discarded Weill-Marchesani syndrome as a diagnostic possibility. Lowe's syndrome is an x-linked disorder with multisystem involvement. Characteristic ocular findings include congenital cataract, also associated with glaucoma and pupillary miosis.18 On close examination, the cataractous lens is generally found to be small in size and discoid in shape.19 As in chondrodysplasia punctata, radiographs occasionally reveal epiphyseal stippling.3 In contradistinction, however, there is no proximal lens shortening, aminoaciduria is always present secondary to a proximal renal tubular abnormality, and 30% of Lowe's syndrome patients have congenital glaucoma.18 These dissimilarities allowed us to eliminate Lowe's syndrome from consideration. It is unlikely that this case represents the coincidental occurrence of two unusual syndromes. The incidence of chondrodysplasia punctata is reported to be 1 in 500,000 births.20,21 The incidence of isolated microspherophakia in patients without a systemic syndrome has not been determined; however, we estimate it to be less than 1 in 500,000 births. The probability that these two rare diseases occurred coincidentally in our patient is 1 in 2.5 × 1012; therefore, this possibility seems unlikely as well. We propose that microspherophakia is a commonly occurring yet previously unrecognized ocular manifestation of the rhizomelic or autosomal-recessive form of chondrodysplasia punctata. In the present case, the presence of microspherophakia was not definitively determined until the anterior segment details were examined using the operative microscope. Initially, it was thought that the cataract was lamellar in type and that the clear zone peripheral to the lens opacity represented uninvolved peripheral lens cortex. However, at surgery the cataract was found to be total, and the clear peripheral zone was the zonular region and not normal peripheral lens cortex. Detailed descriptions of cataract location are generally lacking in previous case reports; however, in two instances cataracts were described as "cortical" in one patient3 and as "small central" in two other patients.10 It is possible that these authors were fooled, as we were initially, and that these patients also had microspherophakia with complete lens opacifications surrounded by the clear zonular apparatus. We suspect that microspherophakia is commonly present in the severely affected autosomalrecessive rhizomelic type of chondrodysplasia punctata. Because slit lamp examination is difficult and surgery is deferred because of the poor prognosis, the presence of microspherophakia has been unrecognized until now. In summary, we report the first case of microspherophakia in association with chondrodysplasia punctata. We encourage careful examination of future cases of the rhizomelic or autosomal-recessive form of chondrodysplasia punctata to determine whether this is a chance association or a common ocular manifestation. 1. Conradi E. Vorzeitiges Auftreten von Knochen und eigenartigen Verkalkungskernen bei Chondrodystrophia fotalis Hypoplastico, Histologische und Rontgenuntersuchungen. J Kinderheilk. 1914;80:86-97. 2. Tasker WG, Mastri AE, Gold AP. Chondrodystrophia calcificane congenita. Am J Dis Child. 1970;119:122-127. 3. Silengo MC, Luzzatti L, Silverman FN. Clinical and genetic aspects of Conradi-Hunermann disease. J Pediatr. 1980;97:911-917. 4. Gilbert EF, Opitz JM, Spranger JW. Chondrodysplasia punctata rhizomelic form: pathologic and radiologic studies of three infants. Eur J Pediatr. 1976;123:89-109. 5. Bessiere E, Riviere J, Leuret JP. Le rebeller, an association of Kleinfelter's disease and congenital anomalies, camptodactyly microphakia. Bull Soc Ophtalmol Franc. 1962;62:197-200. 6. Heymans HSA, Oorthuys JWE, Nelck G, Wanders RJA, Schutgens RBH. Rhizomelic chondrodysplasia punctata: another peroxisomal disorder. N Engl J Med. 1985;313:187-188. 7. Kelley RI. The cerebrohepatorenal syndrome of Zellweger, morphologic and metabolic aspects. Am J Med Genet. 1983;16:503-517. 8. Spranger JW, Optiz JM, Bidder U. Heterogeneity of chondrodysplasia punctata. Humangenetik. 1971;11:190-212. 9. Happle R X-linked dominant chondrodysplasia punctata. Review of literature and report of a case. Hum Genet. 1979;53:65-73. 10. Curry CJR, Magenis RE, Brown M, et al. Inherited chondrodysplasia punctata due to a deletion of the terminal short arm of an x chromosome. N Engl J Med. 1984;311:1010-1015. 11. Johnson VP, Grayson M, Christian JC. Dominant microspherophakia. Arch Ophthalmol. 1971;85:534-542. 12. Waardenburg PJ, Franceschetti A, Klein D. Genetics and Ophthalmology. Springfield, 111: Charles C. Thomas; 1961:960. 13. Jensen AD, Cross HE, Patón D. Ocular complications in Weill-Marchesani syndrome. Am J Ophthalmol. 1974;77:261-269. 14. Marchesani O. Brachydactylia and congenital spherical lens as systemic disease. Klin Monatsbl Augenheilkd. 1939;103:392-406. 15. Sohar E. Renal disease, inner ear deafness and ocular changes: a new inherited familial syndrome. Arch Intern Med. 1956;97:627-630. 16. Roy FH. Ocular Differential Diagnosis. Philadelphia: Lea and Febiger; 1975;348-349. 17. Magnasco A, Zingirian M. Unusual malformation association: Mandibulofacial dysostosis and bilateral microspherophakia. Ann Ottal. 1965;91:489-496. 18. Tripathi RC, Cibis GW, Tripathi BJ. Pathogenesis of cataracts in patients with Lowe's syndrome. Ophthalmology. 1986;93:1046-1051. 19. LaPiana FG. Renal disease. In: Thomas D. Duane, ed. Clinical Ophthalmology. Philadelphia: Harper and Row; 1986:3-4. 20. Josephson BM, Oriatti MD. Chondrodystrophia calcificans congenita. Pediatrics. 1961;28:425-435. 21. Fraser FC, Scriver JB. A heredity factor in Chondrodystrophia calcifans congenita. New Engl J Med. 1954;250:272-277.